title to jump to the review below. For more reviews, please click here. As I've said once and again, wine always makes a great holiday present. Then there's that other time-tested cliché: Variety is the spice of life. So, if you're bored or otherwise disinclined to buy that wine lover in your life a bottle of vino this holiday, why not try the gift of literacy? While 2006 offered slim pickings in your book shop's wine section, one volume that stood out for me is Natalie MacLean's Red, White, and Drunk All Over: A Wine-Soaked Journey From Grape to Glass. I've been a fan of MacLean since she first started publishing her online wine column Nat Decants in 2001. She takes a self-effacing and real-world attitude toward wine and is anything but stuffy on the subject. MacLean freely admits she likes the buzz and lightness of spirit that wine gives her as much as she enjoys the vast history and complex aromas and flavors of this ancient beverage. As she traipses through France, New York and California's wine regions, you get the feeling you'd just like to hang out with her and shoot the breeze over a bottle of wine. MacLean only recently came to wine in a serious vein, which lets her view the topic with childlike wonderment as she visits with folks like Aubert de Villaine of Domaine de la Romanée-Conti, Frédéric Drouhin of Maison Joseph Drouhin and the unpredictable Randall Grahm of Bonny Doon. Readers tired of frumpy, curmudgeonly wine writers, who require a set of reference books to comprehend, will find MacLean's approach refreshing. In addition to trekking through the wine regions of Burgundy, Champagne and California, MacLean went undercover to see what life is like for those who sell wine for a living. She spent time working in wine shops in San Francisco and New York. She also worked a tense evening selecting wine for guests at Baccara, a five-star French restaurant in Quebec. Her writing style is most definitely playful, but MacLean harbors an ulterior motive in Red, White, and Drunk All Over. As she rambles through vineyards and occasionally stumbles tableside in the dining room, she subtly informs the reader on dense subjects like biodynamic farming, food-and-wine pairing, the effects of 2, 4, 6-trichloroanisole on wine and why wineglasses come in so many shapes. You can read more about what MacLean is drinking at her Web site, www.nataliemaclean.com, where you'll also find her just-launched food-and-wine matching database. It's been said that she writes about wine with "a sensuous obsession." She subtitled her first book, Red, White and Drunk All Over, "A wine-soaked journey from grapes to glass." The word "moderation" does not seem to be part of her vocabulary. The trouble with moderation is that it's hard to get excited about, she once wrote. Ladies and gentlemen, please welcome Ms Natalie MacLean, Canada's answer to Hugh Johnson, Jancis Robinson et al. Like so many things on the Internet, I found Ms. MacLean's site almost by chance. Ms MacLean likes wine with a passion. She writes about it with gusto and flair. After 10 minutes of reading her stuff I felt it was time to open a bottle and continue my reading with a glass in hand. We rarely see Canadian newspapers in our tropical climate, which explains why her name had failed to register so far. My mistake. I should have known. She claims descent from a long line of hard drinkers. She is a certified sommelier and worked for a while in a restaurant. She is also a dedicated advocate of Highland dancing, another form of entertainment rarely seen in Bangkok. I'm totally unqualified to say anything about the subject, but she must be good at it, since when she was 17 she placed fifth in the World Championship of Highland Dancing in Scotland. I can even imagine that a bit of Highland Dancing could be a radical way to get rid of the consequences of any excess drinking. In her photo, she certainly looks fit. She also studied - with success - 19th-century English literature at Oxford, along with a few other subjects. But as she writes herself, all that was irrelevant for her future career and her true passion: wine and writing about it. One of the nice features of her website is a section titled Wine and Food. Just enter the name of a dish or the type of food you have in mind, and click. You'll be asked to refine you choice. Another click and here it is, the answer. One example: I entered "cheese." In the next step I was presented with a long list of cheeses. I entered "Gruyere," having just received a nice piece of this Swiss marvel from a friend back from Geneva. Click. The answer? A late harvest riesling, a pinot noir, a chardonnay or a dry riesling. Thai food? You will have the choice between Thai food in general, green curry, or shrimp. Answer? A blanc de blanc champagne, or more affordable, aligote, chenin blanc, colombard, gewurtztraminer, pinot gris, riesling or sauvignon blanc. Pretty straightforward I'd say, and quite logical. A green curry will go well with a pinot blanc, and shrimps will be happy with muscadet, orvieto, pinot blanc again or sauvignon. I would add that with Isan food you could do well with beer or cold water. No matter what they say, I have rarely enjoyed a red wine with our local food. You need the acidity of a good white, and in some cases the off-sweetness of some New World whites. You can find her at http://www.nataliemaclean.com. It's worth a visit, unless you think a glass or two of good wine is a capital sin. But then, who says that a little sin, now and then, is not good for you? Food and wine books continue to be sure-sellers, even if buyers neither cook the coq au vin or taste Chateau Lafite. Reading about them, possibly plonk in hand, has its own hedonistic pleasures. Broadly there are two types of wine book. Firstly, the highly technical guide, written by professionals for professionals - or wannabes. The best of these continues to be The Oxford Companion to Wine. Then there are the gossipy, journalistic forays into the subject. When well written, they're an excellent way of picking up wine information casually. Veteran wine-writer and broadcaster Jancis Robinson does both. Apart from editing the Oxford Companion, she is the author of too many books to count, including an entertaining and informative account of her wine-life so far. Now along comes Canadian wine-writer Natalie MacLean with Red, White and Drunk All Over, wine region forays, chats with producers, work as a sommelier and even interviews with -yes - Jay Mc Inerney and Jancis, among others. MacLean's considerable knowledge of the subject is delivered to the reader in a pain-free, easy-reading journalistic style. Kinda puts Jilly Goolden's cigar-boxes, wet wool and sweaty leather in the shade. Anyway, after a cold shower, look Natalie up at www.nataliemaclean.com. Wine inspires passion and fear in equal measure: The mystique that makes it attractive is also an obstacle to its enjoyment. That's the central message of "Red, White and Drunk All Over" by Natalie MacLean, an irreverent book that takes readers on a brisk canter through the world of wine -- from vineyard to vat, bottle and dining table. "Most people would rather memorize the periodic table while getting a root canal than choose wine from a restaurant list," she writes. To illustrate the point, she goes undercover as a sommelier in a restaurant in Quebec for an evening. MacLean eavesdrops on a couple debating whether an Alsatian Riesling comes from France or Germany, effortlessly sells a $500 bottle of Chateau Talbot 1961 to a more self-assured customer, then blots her copybook at a third table by dripping a California cult cabernet all over a crisp tablecloth. She recounts with admiration how the restaurant's resident expert guided customers through a 17,000-bottle cellar, offering them choice without embarrassing them into ordering a wine they couldn't afford. And she berates restaurants that peddle sub-standard house wines to customers. "Drinking them is like accidentally walking into a bad neighborhood: You'll get roughed up and robbed and will learn never to take that wrong turn again." The anecdotes make this book, which lives up to its subtitle, "A Wine-Soaked Journey From Grape to Glass." MacLean visits producers in California, Burgundy and Champagne. Near Monterey, she picks grapes on a back-breaking 45-degree slope under the relentless heat of the California sun. In Burgundy, she enters the historic cellars of Domaine de la Romanee-Conti, correctly identifying a bottle of La Tache in a tasting test with winemaker Aubert de Villaine as coming from the 1956 vintage, while admitting it's a "wild guess." Wine is "as cerebral as it is sensual," she writes, adding that mainstream literature on wine often gives her "the odd impression that it has no alcohol in it." She lifts the lid on the retail trade, spending time with Chuck Hayward, managing wine buyer of the Jug Shop in San Francisco, and working for a day at Discovery Wines in Manhattan. One theme of the book is that there's no simple relationship between quality and cost. "Selling expensive wine is easy," she quotes Hayward as saying. "What's really challenging is selling a bottle that's under priced, even cheap." Novelist and oenophile Jay McInerney, with whom she shares some vintage glasses over dinner in Greenwich Village, is quoted as making a similar remark. "Any idiot can buy expensive wines," he says. "You need to know what you're doing to choose something delicious and reasonably priced." MacLean, who has been writing about wine since 1998 and publishes her own newsletter, also explores rivalries among wine critics, analyzing an epic clash of opinion between U.S. wine guru Robert Parker and British writer Jancis Robinson over the merits of 2003 Chateau Pavie wines from Saint-Emilion. And she spends an evening with crystal stemware maker Georg Riedel, finding out how the quality and shape of a glass may radically affect the taste of wine drunk from it. The writing is light, breezy and engaging. MacLean's trips to vineyards and wineries illustrate her theme well. Most readers will appreciate the refreshing angle she brings to an industry that can be too steeped in its own traditions. This volume doesn't fit into either of the two classic categories for wine books: It's neither a glossy coffee-table book nor a guide to producers. Instead of photos, maps and vintage charts, it offers quite simply a good read. Scan the shelves of books available about wine and you'll begin to notice common words. There are guides, encyclopedias, courses, companions, compendiums, World's Greatest, and lots of "How To" books (how to taste, to serve, to cook with, to buy, to make; the list goes on and on). Within the world of wine books, the writing tends to be one of extremes. It's often either high-toned and perplexing purple prose, or it's technical graph-and-charts stuff that is sure to eventually make your eyes glaze over and your brain hurt. But there is hope for the wine-curious among us. Natalie MacLean's Red, White, and Drunk All Over falls into an emerging category of wine writing that reflects the growing popularity of wine in our everyday lives: that of wine as a "journey." In this case, "A Wine Soaked Journey from Grape to Glass." It is a journey that MacLean is eminently qualified to take. Natalie MacLean may well be Canada's most famous wine writer. She counts among her achievements four James Beard Foundation awards, including the MFK Fisher Distinguished Writing Award, and she's won a World Food Media Award which named her World's Best Drink Writer in 2003. Her magazine articles, newspaper pieces, and her website (NatalieMacLean.com) have reached thousands of wine lovers both in this country and abroad. Inspired by her own curiosity, and questions asked by her readers, MacLean explores some of the issues that underlie our fascination with wine. "I wanted to find out why we accord wine such high status, more than any other drink we consume," she writes. Through a series of engaging interviews with wine professionals, and through warm, and often humorous, bits of personal experience and insight, MacLean chips away at this question. She kicks things off in France's Burgundy region, where we meet Domaine de la Romannee-Conti vintner Aubert de Villaine. It's an interesting place to start, as DRC's wines are among the most expensive in the world. From there we skip across the pond to California, where we meet Bonny Doon's controversial Randall Grahm, who provides some of the more delicious quotes in the book. Take this exchange: " 'French wines rock -- they have soul,' Grahm declares over the din, as we taste his syrah. 'New World wines are all a facade.' 'Even yours?' I ask. 'Ours are genuine plywood veneer,' he says." We zip back across the pond again to explore Champagne, where some of the region's best producers debunk myths and misconceptions about the world's most celebrated celebratory drop. The domestic experience of wine is addressed in the final chapters of the book. The philosophies of two very different wine shops are examined. Georg Riedel once-and-for-all answers the question: Does stemware really make a difference in tasting wine? And MacLean goes undercover as a sommelier in an upscale restaurant, giving us insight into what goes on behind the scenes. Red, White, and Drunk All Over is immensely enjoyable. MacLean has managed to realistically show an industry that is lively, colourful, and filled with people who are defined by their passion for wine. Hers is a world of wine that is the antithesis of the dull, dry and dusty one we've come to expect. Red, White, and Drunk All Over is the new book by Natalie MacLean, who is known for her online newsletter, Nat Decants. The book is a breezy, laugh-out-loud funny, peek behind the curtain of the wine trade. I devoured it in one sitting, and promptly bought two more copies for friends. While you are at it, sign up for her newsletter -- it's free, at www.nataliemaclean.com. Many experts write insipidly about wine... until recently. Lately, some writers describe with astute observations dressed in belle language and hilarious anecdotes. Natalie MacLean is an excellent example. The Canadian sommelier and journalist has won several prizes for her writing, including the James Beard Foundation award. Her online newsletter is ragingly popular. Natalie MacLean is the writer of a book in which you want drown: Red, White, and Drunk All Over. (The title in Dutch is less persuading than the English version.) MacLean inspires with her accessible style and metaphorical language. The lively blonde lady talks with love and simplicity concerning her work. You will not catch her engaging in any snobbery. "I'm attracted by wine because it brings me in another state; I'm meditative." She has two cellars in her house, with a total of about 1,500 bottles. The secret of a good taster, according to MacLean, is that you're curious and wonder what's going on in your glass. Our sense of smell is underestimated. In ancient days, smell played a much larger role in our lives. Think, for example, of hunting. If you pay attention, she says, you can develop an aroma vocabulary. "I always smell fruit and vegetables when I cut them open. People can distinguish more than 2,000 different aromas, but just five tastes in our mouths." For the holidays, MacLean suggests an Australian red wine: the 2004 Burley Griffin Vineyards Shiraz. It's a firm, full-bodied wine with delicious aromas of ripe plums and berries, she says. A well-written romp through the wine world. MacLean tours the domains of Burgundy as a writer, toils in a New York wine shop, serves as a sommelier at an upscale Quebec restaurant and breaks bread and drinks wine with US author Jay McInerney. She segues from her adventures to fill readers in on Robert Parker, Jancis Robinson and purple prose, and Georg Riedel and the difference a glass makes, and other topical issues. There are flashes of humor, useful information woven into her escapades, and the comforting feeling that, as a reader you are in capable hands. Wine and writing are a tasty blend, and Natalie MacLean is a connoisseur of both in Red, White and Drunk All Over: A Wine-Soaked Journey from Grape to Glass. As fond of vintage culinary writers (such as M.F.K. Fisher) as she is of the sound of corks popping, MacLean is a companionable and literate guide. She keeps her sipping adventures and travels lively and upbeat in this tour of the international wine world. MacLean's guide to wine is engaging, practical, and perfect for novices. Red, White, and Drunk All Over: A Wine-Soaked Journey from Grape to Glass profiles the colorful characters of the international wine scene, including a smooth-talking Burgundy winemaker and a young California vineyard manager who surfs the waves on weekends. Natalie MacLean is a certified sommelier, writer and publisher of the award-nominated web site Nat Decants. Quick taste: "When we share good wine with good friends, we also share what makes us human: sensual pleasure, conversation and connection." Natalie MacLean is a new force in the wine writing world-a feisty North American answer to Hugh Johnson and Jancis Robinson. She is not obsessed with scoring wines like the world's most famous wine writer, Robert Parker, but a purveyor of wine knowledge and above all enthusiasm to middle America. She can write beautifully about wine, especially when she visits growers in Burgundy and Champagne. Her mission to produce a middle-brow wine primer causes this book to feel like a curious blend. All the same, this reader cannot help warming to MacLean's uninhibited enjoyment of wine: this is a book that will turn many people on to the world of Bacchus. It seems so sad, when women are now proved to be such good tasters and so many of them are visibly interested in wine, that the bulletin boards and so much of the printed wordage is hogged by men. MacLean (whose book is published in the UK in April) is Canadian, in fact so energetically has she promoted her newsletter Nat Decants that outside Canada she may well be the best-known Canadian in wine. Her relationship with wine is sensual, very personal and she acknowledges, and occasionally embraces, an aspect of it virtually ignored by most wine books: its delightful effect on the nervous system. She has very cleverly wrapped a wine primer in such appealing anecdote that any reader, male or female, should find learning about wine completely painless. Like a breath of fresh air through a vineyard, award-winning wine writer Natalie MacLean's new book Red, White, and Drunk Over breezed onto store shelves recently. Written in the style of a memoir, the book follows the story of wine from grape to glass, introducing readers to unforgettable characters and adventures along the way. Whether you've been no nearer a vine than watching the movie Sideways or are an experienced oenophile, MacLean's book will educate, entertain, and best of all, make you laugh out loud. Books about wine are not necessarily the most refreshing of reads, but Natalie MacLean's Red, White, and Drunk All Over: A Wine Soaked Journey from Grape to Glass is an honorable exception. The wine writer has based the book on her personal journey through the wine world, and it includes reminiscences of encounters with wine's most colorful characters. Pick up the new UK edition for a light-hearted, entertaining read. Note: The Globe & Mail chose Red, White and Drunk All Over as one of the Best Books of 2006. It's the cusp of the fall and two of the season's most traditional offerings are travelling unique paths to their appointed destinations: wine grapes to the vat houses, and new titles to the bookstores. Professionally, I wave about with both the hand of an ink-stained wretch and another dyed a violet hue, and so here's a perilous challenge: As a winegrower, I am at the mercy of scribes such as influential Canadian wine journalist Natalie MacLean. Slice gleefully into her new (and debut) wine-soaked book, and I might rightfully expect to endure a lifetime of hostile, indifferent or, even worse, unwritten reviews of whatever bottles I send out into the world. Fortunately, I can say this volume is far more enjoyable and memorable than a disturbing quantity of wines available for $29.95. As a bonus, it can be consumed over and over again, and is not nearly so temperamental about storage. However, it is best enjoyed if you've never viewed Jancis Robinson's television Wine Course or the documentary film Mondovino, or thumbed an issue of the Wine Spectator. Wine geeks (though not wine bores) will find pleasure and a few new insights, but for someone fairly new to wine, and eager for more sustenance than the meagre gruel of "buy this bottle" consumer journalism, then this is a very inexpensive grand tour of the whole business. And I mean from berry to bathroom. MacLean has written for numerous magazines over the past decade or so, and now primarily focuses on her award-winning website and e-mail newsletter. She started wine writing for the lamented glossy, stylish and intelligent President's Choice foodie magazine (as I did), and worked hard at honing her skills at Saturday Night, and wherever else an enlightened Canadian editor lurked. In Red, White, and Drunk All Over you have very good, keen, honest journalism. MacLean delivers clarity and taut, crisp prose, and offers amusing, unique and plausible metaphors. Her numerous interviews with noted wine folk are not sentence clips, but unfold with space to give a sense of the subject's thoughts and personality, precisely the way anyone who gives an interview hopes. And how can I not enjoy a book that recounts an early wine-sotted romance and marriage, and then immediately begins in Burgundy . . . even if it is in the dark of winter and with the slight intellectual chill of Aubert de Villaine of Domaine Romanee Conti? It would be nearly impossible. MacLean does appear to take one quote from Grahm about Kermit Lynch to heart: "In his writing, he always evoked the place where the wine was made. . . . He didn't chase after the glamorous wines and he was willing to get dirty to understand wine." Though lured by the glamorous, MacLean does muck about, picking grapes, disgorging the yeast from champagne bottles, staffing the floor of a New York wine shop atop her chafing Manolo Blahniks, slashing champagne bottles with a highland dancer's sword, and doing a turn as a sommelier at La Baccara in Quebec. Somehow, it all reveals a woman with a dash of self-deprecation, a pot of shyness . . . and a simmering boil of the bawdy. Very Canadian, one is tempted to say. The surprise is the shyness, and most of the very fleeting approaches to "drunk all over" or "a wine soaked journey" come as she tries to loosen up or find nerve. "I felt the fingers of alcoholic warmth relax the muscles at the back of my jaw and curl under my ears," MacLean writes in the introduction. "The wine flushed warmth up into my cheeks, down through my shoulders and across my thighs. My mind was as calm as a black ocean." I came away thinking she has offered up a Canadian answer to Garrison Keillor's powder milk biscuits: something "that gives shy people the strength to do what needs to be done." Even with the shyness and furtive moments of Dutch courage, Natalie MacLean flirts, dallies and playfully arches her back in brief stretches of prose that promise more great things to come. I enjoy glimpses, when I desire glasses or barrels. MacLean may well fashion beckoning, lasting wine prose the way Elizabeth David once did, or Jancis Robinson continues to. Revel. Imbibe. Hector. Seduce. Should MacLean do more of it in her next book, it will soar as a Canadian wine book never has. As for this first one . . . well, there is little that has been as cosmopolitan or as pleasantly complete. A witty, anecdotal and entertaining foray into the wide world of wine. MacLean, who also operates the website Nat Decants, shares her encyclopedic knowledge of the grape and its lovers. Best read with a beakerful of the warm South. Note: This is a review of the paperback edition. This book reflects this writer's great sense of humor and love of wine. Natalie is one of the many influencers in the wine press who are pressing for a more simplistic and honest way of thinking about wine. She's persuasive and fun to read. At last, a wine writer who admits flat out she likes the alcohol part about as much as the "nose" and all the other esoteric nuances. Award-winning journalist MacLean aims to welcome fellow enthusiasts, present and future, by sharing formative lessons and experiences in her own development. Often flirting with what amounts to iconoclasm in what is-often for marketing purposes-an over-ritualized, elitist milieu, the author suggests that expert tasters can lose a potentially broader audience with abstract imagery and flavor allusions. (One example: "Think of Naomi Campbell in latex... ") Why not instead, she suggests, talk more about the total experience of imbibing a fine wine in sensuous, personal terms, which she does without hesitation, more than once mentioning her thighs. MacLean also discusses the market-shaping power of wine scribes like Robert Parker and Jancis Robinson, a British woman often at odds with Parker's opinions and particularly his point system for scoring wines. Robinson publicly tastes wines "blind" (labels masked); Parker has them sent to his home, MacLean notes, but doesn't push it and goes on to regularly reference Parker's endorsements of wines she also likes. On some controversial points, she takes a clear stand: The kind of glass you drink from does make a significant difference, for instance, and she always decants her reds before serving. She soldiers through her apprenticeship in some of the world's most heralded wine cellars, also doing duty as a retail clerk in a wine emporium of repute; the resulting knowledge is artfully imparted. Refreshingly accessible and good-humored entrée into the world of fine wine. Yet wine is more than just a release. MacLean, an award-winning Canadian wine writer, is also interested in the reasons why it tastes the way it does. In Burgundy, where �wisps of white smoke snake up from piles of burning dead vines, casting a pale haze on the landscape, like a Matisse drained of its color,� she explores the sometimes perplexing concept of terroir ... the idea that the region's wines owe their length, depth and mineral character to the fossil-rich earth created 200 million years ago. Her description of malolactic fermentation is lent a refreshing new dimension by her description of listening to the gentle bubbling through the hole in a barrel of Domaine de la Romanée-Conti. The fact that Red, White, and Drunk All Over is arbitrary in its outlook, focusing on just a handful of the author's pet subjects such as pinot noir, champagne and the relationship between wine and gastronomy, means that it can remain engaging throughout. For anyone burdened by the demands of this weighty subject (including MacLean's fellow student on a wine course who had read all 820 pages of the Oxford Companion) this book will do much to suggest its lighter side. Wine experts might offer authority but there is no doubt that it is the enthusiasm of newcomers that brings the subject to life. Natalie MacLean confesses - by way of a gentle critique of her fellow wine writers - that she often gets "the odd impression that [wine] has no alcohol in it." "My subject," she merrily admits, describing elite tastings in which she looks around the room only to realize that she's lustily downed two glasses while her colleagues are decorously sipping their first, "is addictive." This and other examples of MacLean's cheerful style put the lay reader at ease. She visits the Pinot Noirs of Burgundy at the tony home of Domaine de la Romanée-Conti; the backyards of Santa Cruz (the Rhone zone); and the Willy Wonkaesque president of Bonny Doon, Randall Grahm - always projecting her contagious enthusiasm. Everything about wine fascinates her, from the terroir in which it grows to the personalities (Robert Parker, Chuck Hayward, Jancis Robinson) who guide and inform our choices. "Red, White, and Drunk All Over" will please the palates of wine lovers everywhere. "The wine flushed warmth up into my cheeks, down through my shoulders and across my thighs." That's Natalie MacLean describing her first time. It was her first really good wine, an Italian brunello she and her husband shared to celebrate college graduation. From that steamy start she has gone on to become a real Renaissance woman -- Rhodes Scholar finalist, English Lit at Oxford, champion of Scottish Highland dancing, named World's Best Drink Writer in an Australian competition. Now she's written a tell-all book, Red, White and Drunk All Over: A Wine-Soaked Journey from Grape to Glass. MacLean's freelance stories run in publications including Bon Appétit, Wine Enthusiast, the San Francisco Chronicle and the Chicago Tribune. Her unorthodox method: Write what she feels like writing, then find somebody to pay her for it. "I follow my passion," she said in an e-mail interview. "If I'm interested in discovering Burgundy, that's where I go and then figure out where to sell the article." Her latest publication is not your grandfather's wine book. She goes on: "By the time we were on our second bottle, I started to feel so flammable that I wondered if I were violating the building's fire code." We may have a new genre here: The wine book as bodice-ripper. After that attention-catching first chapter, however, the book segues into a much more traditional tale of visits to the world's great wine venues -- from the land of high-priced French burgundy to the surreal world of California's eccentric winemaker Randall Grahm. Throughout, she remains engaging, colorful and informative. For example, it's fairly well known that some California winemakers surreptitiously add water to their wines to cut their alcohol levels when they soar beyond the usual 12 or 13 percent. It happens when the grapes get too ripe and full of sugar. But I didn't know they called the added water "Jesus units," from the New Testament story in which Jesus turns water into wine. MacLean pokes fun at wine fans' overheated wine descriptions -- jet fuel, gerbil cage, wood shavings. "Wine descriptions often have a faint scent of condescension over a robust layer of barnyard by-product," she says. But she wields a purple pen of her own in France, describing the land along the river north of Beaune, in the Burgundy region, as "a graceful arc, like the curve between a woman's shoulders and hips." She knows her stuff. Her brief visit with Aubert de Villaine, vintner at Burgundy's fabled Domaine de la Romanée-Conti, produces a nifty, nuanced description of how its $1,000-a-bottle-plus wine is different from the California "fruit-bomb" wines from the same pinot noir grape. "The grapes here just barely ripen in most years, which is why you don't really get the fruity taste you find in warmer regions such as California and Chile. Rather it is the taste of the soil and the weather that emerge from the glass." Through it all, MacLean expresses an unabashed love of the buzz she gets from alcohol as well as the more cerebral appreciation of it -- to an extent that might make some wine writers uncomfortable. She's candid in an interview on her website, nataliemaclean.com: "I do a lot of drinking, and I come from a long line of drinkers." Is she ever criticized for this? "Surprisingly, no," she says. "Most readers are relieved to hear that a so-called `wine expert' loves the buzz. There's a good reason we don't have orange-juice critics." There's something sensuous about Natalie MacLean's new book ... check that: There's a lot that's sensuous about her charming and disarming paean to the wine world. "Red, White and Drunk All Over" is a passion play of sorts (with wine as her religion), starring sundry luminaries of the wine world, not least among them the author. Amid sensory-soaked sagas of sojourns to Burgundy and conversations with winemakers, wine merchants, wine critics, et al., MacLean masters two of the toughest tightrope acts imaginable: writing extensively about her own experiences without making it all about Me Me Me, and providing insight and interest for wine enthusiasts of all stages. We see what she sees, feel what she feels and learn as she learns. With enough wit and wisdom to fill a magnum-sized decanter, MacLean imparts knowledge without seeming "teacherly," thanks in part to a conversational style that never seems "writerly." Only the most harrumphing wine snob could avoid being drawn in by her self-effacement ("I'd love to say that I was born with an uncanny palate, but I was just born thirsty") and self-awareness ("Much as I'm drawn to its nuances, I wouldn't be writing about wine if it weren't for the buzz. I love the way a glass of wine makes me feel -- invigorated and animated, released from my natural shyness"). There's a good bit of fodder for oenophiles -- green harvesting, terroir talk, decanting dos and don'ts -- but MacLean nimbly places those passages into a broader tableau. She is inexorably drawn to people who prefer to view wine as a pleasure rather than something to be deconstructed to death, who understand that "how a wine tastes is different every time you try it," depending on the mood, the food, the company and the evolution of the juice. With an uncommon dollop of common sense, she writes about how stocking a wine cellar is different from other collecting pursuits because it "is as much about letting go as it is about gathering in." And why a special wine with a great bouquet is an utterly unforgettable experience ("smells are routed directly to the areas of the brain responsible for emotions and memories"). And why tart wines are the most versatile at the dinner table ("acidity is the salt of wine; it brings forward the flavor of both the wine and food"). MacLean visits vineyards and stores, works as a sommelier and interviews winemakers, glassmakers and fellow wine writers, including kindred spirit Jay McInerney. She makes trenchant observations (small wine glasses are like seats too close to an orchestra: You miss out on the harmony), recounts history (France's wars in the 19th and early 20th century left mostly women in charge of Champagne's wineries) and mines great material from her sources (California winemaker Randall Grahm on how winemaking techniques have "maxed out," with the next revolution coming in the vineyard). "Wine is as much about camaraderie as taste. When we share good wine with good friends, we also share what makes us human: sensual pleasure, conversation and connection." Red and White and Drunk All Over by Natalie MacLean is a collection of experiences of an award-winning wine writer who publishes a free newsletter, Nat Decants, and writes for several wine magazines. I like her narrative style and when you've read the chapter on Champagne, for instance, there is not much you will not know about its making. If I were to write a book, it would probably be similar to MacLean's, enthusiastic and with some interesting content. Red, White and Drunk All Over by Natalie MacLean: The best way to learn is to feel like you aren't being taught. If Natalie had been my biology teacher I might not have flunked out of applied science in Cegep. Far from being a structured introductory course on wine, her book chronicles her travels and observations about the wine industry - from how to make Champagne to why Burgundy is so fantastic, from Robert Parker to Riedel glasses. This is easy to read, entertaining and surprisingly educational - for everyone from wine novice to expert. Once considered exotic or pretentious, wine is now made, bought and drunk with enthusiasm by North Americans. Moreover, it is a subject of inexhaustible tradition, science, variety and opinion, so we will never lack for wine writers. Natalie MacLean is one of the best. She enjoys drinking, and says so. An accredited sommelier, she has a free online newsletter called Nat Decants, and her lively reviews appear in such magazines as Chatelaine and EnRoute. Each chapter of Red, White, and Drunk All Over deals with a different aspect of wine, from growing the grape and producing the product to choosing and serving it, but the book is not didactic or preachy. It focuses on interesting individuals, like the woman who makes French champagne (do tell! ), the witty wine-store owner in San Francisco and the aristocratic Austrian manufacturer of 103 kinds of wine glasses. This makes for an entertaining read that conveys a wealth of information and opinion between anecdotes. It's rare that one can find a book about wine that doesn't read like a textbook. While most are very informative, the material often can leave a reader with glazed-over eyes trying to sort through the techno-speak found in most wine books. Many seem to be written for the person who already is knowledgeable about wine and wants to fill in the gaps; at the other extreme, there are some books that are so simple that one might think they're written for children. That's why it was such a pleasant surprise to find one that entertains and educates at the same time. �Red, White, and Drunk All Over,� by Natalie MacLean, is written in a very entertaining style, and she uses many of her own experiences to impart information, and it's done in such a way that the reader doesn't even realize that he or she is learning about wine. MacLean teaches by example. She worked for a day in several wine shops and writes about the retail side of the business and how to shop for wine. She worked as a sommelier in an upscale restaurant and talks about how restaurants buy, serve and mark up wine, and adds additional information about how to handle a bad bottle of wine (again relating from her own experience), along with tips on ordering wine. She conducted a wine tasting for friends and goes into detail about how to set up a tasting, and she writes about arranging a Thanksgiving dinner for friends and how she chose the wines to pair with the food. The mandatory visits to wine regions are included, but here, too, she writes in a different style than most wine authors. She talks of her visit to Burgundy and her experiences with some of the top producers, and while doing so, traces the history of Burgundy and explains the complicated appellation system of the region. She visited Seghesio Vineyards in Sonoma County and talks in detail about zinfandel (Seghesio's specialty), giving a history of the area as well. While there she helps test grapes before harvest and this allows her to explain what a winemaker looks for in determining whether grapes are ready. A visit to Champagne also covers the history of the region, but in a manner unlike most other books, and she explains production methods in an easily understandable way, even trying her hand at riddling bottles and relating the mistakes she made. She took a turn at disgorging a bottle of Champagne and describes her experience in dousing her �instructor� and her embarrassment at spraying him. MacLean recounts her conversation with the �bubble professor� who shows her why Champagne has bubbles and allows her to view them under a high-powered microscope, and she describes them in a way that the reader can almost visualize them. She also explodes some myths about Champagne. She met Georg Riedel, of the Riedel glass fame, and this enables her to describe the differences among various wine glasses and launch into a discussion on how to taste wine. It is easy to relate to some of her anecdotes, such as the one when she was serving wine while acting as a sommelier, and dribbled some red wine onto the tablecloth, or when she was served a bottle that had been corked and the waiter refused to acknowledge that it was bad. MacLean's book is an easy read, and even a sophisticated wine enthusiast will learn something from it. It's ideal for someone who is interested in wine, doesn't know much about it but wants to learn more. It's a good one for local residents to have around when visitors arrive who are not very wine savvy. Ms. MacLean has made a name for herself on the Internet, where her site Nat Decants (nataliemaclean.com) has won numerous awards. Ms. MacLean is the disarming Everywoman. She loves wine, loves drinking and loves getting a little buzzed. But as she follows wine's journey from vineyard to cellar to retail shop, restaurant and dining room, she can't help feeling insecure. She fears embarrassing herself in front of Aubert de Villaine, the proprietor of the august Domaine de la Romanée-Conti, on a visit. Instead he opens a 1956 La Tâche for her. She takes a turn as a retail clerk and her shoes kill her. She invites friends to a tasting party, but sweats with anticipatory anxiety. She bursts into tears when confronted with an unsympathetic sommelier. �Who knew that rejecting a bottle of wine involved the same arc of emotions as Greek tragedy?� she writes. At times her enthusiasm gushes like Champagne opened improperly. But ultimately, it's a winning formula, aimed at women who are intimidated by wine, and at men who feel that way, too, but won't admit it. As escape fantasies go, it's an appealing one: a thirtysomething chucks a career in tech marketing to build a living around her love of wine. MacLean succeeds in her gambit and in the process serves up a fun look at the lives of others-vintners and wholesalers, researchers and restaurateurs-who have made their own careers in this ancient trade. Neither an excoriating polemic nor a shameless exaltation of the famous and the fatuous, MacLean's book refreshes with its evenhanded treatment of the outsized personalities populating this industry. And her love isn't blind, as shown by her frank acknowledgment of the specter of alcoholism that lurks amid the finest vines. Ottawa sommelier and writer Natalie MacLean takes readers into the wine cellars of the world in this "Wine-soaked journey from grape to glass." And what a tour for anyone -- from connoisseur to Baby Duck aficionado. Not only does ("Comfort me with cabernet") MacLean show you the way to get your head around that wonderful, ancient beverage, but she also shoulders up to the bar with you to indulge. You'll drop by many of the world's winery hotspots, including the Old World's best -- Burgundy -- and, yes, Canada, too, in this sweeping tale about the grape. If wine is part of your life, you can't ignore this tome. I just finished Natalie MacLean's book "Red, White and Drunk All Over." Ms. MacLean, a Canadian from Ottawa, has a web site full of useful information for beginner oenophiles. The book distills all of this knowledge and experience into 274 pages and it's a good read. Natalie takes you on a tour of the wine world with a palpable excitement. I could feel myself talking with her on several occasions, and as she is a certified Sommelier, this is a great experience. The feeling, in my early wine experience is that I felt I could talk to her seriously about the subject, and to that end I felt pretty good about my knowledge. She gallops (no other word to use here) from vineyard to vineyard, through grapes, styles and regions, writing, glassware, wine stores, and other wine fans. I really enjoyed the exposure to Seghesio winery as it happens be one of my favorite Zins. And then there is the controversy of Pavie; Robert Parker, Jr. and Jancis Robinson's feud about scoring and taste. There is no right and wrong here, only the luxury of influencing millions of wine enthusiasts. While there seemed to be a slight tilt toward Ms. Robinson's perspective the two sides of the argument seemed well represented. The whole question of scoring always comes up when Parker's name is mentioned, and it's mentioned frequently in this book, but there is no one on the planet that has done more to make wine accessible. Walking into a wine store and seeing hundreds of bottles of Cabernet or Bordeaux, his scoring provides a immediate shortcut. Mr. Parker's scoring provides many (maybe too many) people with a short hand for discovering wine. It would be so much better if everyone had enough knowledge to buy the evening vino. Ms. MacLean is a descriptive and enthusiastic writer and this is the draw of the book. Almost like reading a description from the kid entering the candy store. She gives you more information on various subjects and you can dig more into these areas, but you need to be careful not to miss them. For the beginner this is a definite read, for those who are not quite beginners, it feels familiar, but definitely enjoyable. Experienced folk will like it because there will be a match in experience or because they can appreciate that Ms. MacLean has opened up new territory for a new class of wine drinkers. Enjoy this book like the first glass that opened your eyes to a world beyond a label. MacLean's enthusiasm for wine is contagious. For the winner of the prestigious MFK Fisher Distinguished Writing Award, each glass represents a personal history, "a secret cellar in our minds where we collect our empty bottles filled with memories." Her passionate desire to learn about all aspects of wine increases its sensual pleasure, and her goal "to demystify an intimidating world" succeeds. MacLean interviews everyone from grape growers in Burgundy to upstart zinfandel producers in Sonoma Valley. Every encounter incorporates vivid descriptions of tastings and colorful personalities. Randall Grahm of Bonny Doon Vineyards in Santa Cruz, Calif., bucks the trend of his California competitors, insisting a "great wine is... not a confection of the laboratory, but a subtle expression of the soil from which it sprang." For casual wine lovers, MacLean deciphers the perplexing dilemmas of appropriate wine aging without pedantry. For the purist, however, "life is too short to drink good wine out of bad glasses." That observation leads to the explanation for 103 different shapes of glassware. Solid research, a breezy style and commonsense advice prove invaluable for the novice, while her good humor will delight the connoisseur. We'd also like to suggest books, as this person might be serious enough about wine to sit down and read. Natalie MacLean's new book, Red, White and Drunk All Over is funny, informative and interesting reading. From Eric Asimov's column in the December 6 New York Times, his holiday wine book roundup: "Ms. MacLean is the disarming Everywoman. She loves wine, loves drinking and loves getting a little buzzed. But as she follows wine's journey from vineyard to cellar to retail shop, restaurant, and dining room, she can't help feeling insecure." He was writing about MacLean as she presents herself in her book, Red, White, and Drunk All Over: A Wine-Soaked Journey from Grape to Glass. Asimov opposed that insecurity -- MacLean herself characterizes it as "the general uncertainty that runs through the book." MacLean's method throughout: find a story upon which to hang the investigation. A visit to Burgundy's Domaine Romanee-Conti gives her space to talk about soil and vines; the tale of a dinner party lets her ruminate on wine and food pairing, etc. She comes across as more of a student than Jay McInerney, but interestingly enough, she does more teaching along the way. "When I go to a region, that's when I learn about it, and when I went to these places in the book, they were my first trips there. I hope that keeps the perspective fresh, keeps the feeling that you're learning along with me. "I'm trying to use the approach my mother did when I was little," she explains, "bury the peas in the mashed potatoes, so that you still get the nutrition, but it tastes good. You need to know how wine is made before you buy it, how to buy it before you match it with food, how to match it with food before you tackle a restaurant list...." (Collecting, the McInerney chapter, comes last of all.) "The chapters are structured around the most commonly asked wine questions." Again, she ought to know -- through her website, she gets about 200 e-mails a day, many of them asking questions about wine. "The Internet has been bigger than I ever thought it could be," she says. "In terms of the connection with wine lovers, ideas for stories, editors finding me, and now marketing the book." Not to say she isn't interested. "The book has been satisfying, even though it was a huge commitment. That's why I want to do it again." Reading Red, White and Drunk All Over: A Wine-Soaked Journey from Grape to Glass, I couldn't help but compare its author, award-winning wine journalist Natalie MacLean, to George Plimpton. Plimpton was famous for participating in professional sporting events and then writing about the experience. His most famous sports romp was with the Detroit Lions as a backup quarterback during spring training. From that experience came a best-selling book and the movie "Paper Lion." Instead of enduring bone-crushing sports, MacLean rolled up her sleeves and sipped, spit and slogged her way through the wine world. In a series of adventures, MacLean revealed she fears no wine snobbery whether she is undercover as a sommelier at a five-star French restaurant or on the staff of high-end wine retailers in New York and California. One adventure had MacLean working at Bonny Doon Vineyards winery in Santa Cruz, Calif. "He gives me a pair of knee-high black rubber boot and leads me over to a pile of those python hoses," she writes. "He puts a heavy nozzle in my hands and walks away. He's 10 feet off before I realize that I'm supposed to follow him while hauling this hundred-pound sucker." After a brutal day in the winery, MacLean is exhausted. "I'm surprised that someone hasn't yet published a book called The Total Winery Workout: Develop Harvest Abs, Grape Crushing Thighs, and Buns of Stainless Steel. At last, I have become one with my subject. I feel like a human grape: sticky, purple and completely crushed." MacLean's book is unpretentious, honest and humorous. What other wine writer would admit that one of wine's fundamental charms is its alcohol. "I have to confess, much as I'm drawn to its nuances, I wouldn't be writing about wine if it weren't for the buzz," she writes in the book's introduction. "I love the way a glass of wine make me feel - invigorated and animated, released from my own shyness." MacLean, an accredited sommelier and wine judge, is no paper tiger when it comes to knowing wine. Her writing has been honored with many awards including four James Beard Foundation Journalism Awards. MacLean turned to her chef friend Tracey Black for a traditional dish, Spring Navarin of Lamb. Black is the executive chef of Epicuria Fine Foods and Catering. Navarin simply means a lamb and vegetable stew. The secret to this dish is the fresh vegetables - get the very best you can. Boneless leg of lamb is available from your butcher or at most big box stores like Costco. Most spring lamb is excellent this time of year. American lamb has a reputation for a milder, less gamey flavor than its Australian and New Zealand cousins. Lamb is one of the very best meats to match with wine. Almost any wine will go with lamb including red, white and rose, though the traditional choice is a red. "I'd match this to a cabernet either from California or Bordeaux," suggests MacLean. "It's a classic pairing since the juiciness of the meat goes so well with the tannins and flavors in the wine." We've taken MacLean's advice and selected a fruit forward 2003 Frank Family Vineyard's Napa Valley Cabernet Sauvignon ($45) for a great match with the savory lamb stew. It has complex layers of cherry, chocolate and blackberry. It is well balanced with refined tannins and perfect acidity. 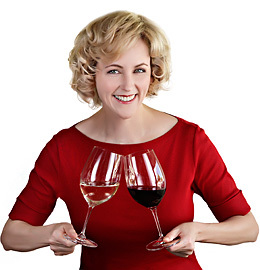 MacLean has an elaborate Web site featuring wine and food pairing information and a free, easy-to-use matching tool: http:// www.nataliemaclean.com/matcher. Cut lamb into 1 inch cubes and pat dry. Season lamb with salt and pepper. Heat saute pan to medium-high temperature; add vegetable oil and brown lamb in small batches. Set lamb aside in braising pot. Saute onions in browning pans, adding garlic when onions have softened. Add rosemary and thyme when onions have browned. Saute for 2 to 3 minutes and then add mixture to lamb. Deglaze browning pans with red wine and reduce by 1/2. Add tomato pulp to pot. Add enough stock to bring liquid level to just below covering meat. Bring to a boil and simmer for 1 1/2 to 2 hours or until fork tender. Lamb can also be placed in 350 F oven for the same amount of time. While lamb is braising, prepare vegetables. Separately, cook carrots, potatoes, onions and green beans in salted water until just done - keeping them slightly crispy. Cool them immediately in ice water. Saute mushrooms and leeks. When lamb is ready, remove from pot and skim off excess fat. Reduce to thicken or thicken with 1 tablespoon of cornstarch slurry. Add lamb and vegetables to pot and simmer for 5 to 10 minutes until heated through. Books on wine often read like textbooks, with long passages devoted to topics like malolactic fermentation. But Natalie MacLean's "Red, White and Drunk All Over" is a lively read that demystifies the fine art of drinking vino. Her "wine-soaked journey" veers from fun to serious, including a night working undercover as a sommelier at a high-end French restaurant and a trip to the legendary Burgundy producer Domaine de la Romanee-Conti. Want a peek at what it's like being a wine writer? Then check out Red, White and Drunk All Over: A Wine-Soaked Journey from Grape to Glass by Natalie MacLean, a memoir that's also educational. MacLean -- who has written for various publications and has a popular Web site (www.NatalieMacLean.com) and newsletter -- is adept at weaving basic information into her entertaining narrative. Her account of dinner with novelist Jay McInerney, who writes about wine for House & Garden, provides a vehicle for discussing how wine ages and strategies for starting a wine collection. A chapter contrasting two wine stores includes a lengthy discourse on the Australian wine industry. Her take on the recent feud between American wine critic Robert Parker Jr. and British writer Jancis Robinson (the Oxford Companion author mentioned earlier) spends some time on the vagaries of tasting lots of wines and numerical scores. All in all, it's eminently readable (not to mention realistic). The San Luis Obispo Tribune published the same review as the San Jose Mercury News. The title Red, White and Drunk All Over caught my eye because it's bold, irreverent and playful. This opus by Natalie MacLean, subtitled "A Wine Soaked Journey from Grape to Glass," is a great read for people who want an adventuresome romp through the key regions of the wine world without ever leaving the comfort of their armchair. MacLean is perhaps Canada's best known wine writer, a sommelier and journalist who has a slew of honors to her credit, including multiple James Beard awards. As it says in her online biography (at nataliemaclean.com): "Her unswerving goal in life is to intimidate those crusty wine stewards at fine restaurants with her staggering knowledge." She writes with wit and clarity in a style everyone from experts to novices can appreciate. But here's the best part about her book: MacLean takes people to places that might otherwise be off limits to them. In fact, her first wine escapade is to Burgundy, where she visits the famed Domaine de la Romanee-Conti. The winery is next to impossible to find, with its modest gate on a narrow alley, but MacLean says it's also rumored this winery has refused appointments with celebrities and politicians. What makes it such a choice spot? Many believe it makes the finest wine in the world, for which fans are willing to pay top dollar. MacLean writes: "New York wine retailer Sherry Lehmann sold the 2002 Romanee-Conti for $2,275 per bottle." Readers get to meet the vintner behind this bottling and learn why he charges such staggering prices. Another fascinating stop on MacLean's tour is Champagne, where we get a good sense of the widows in the 19th and early 20th centuries who took over the business after losing their winemaker husbands to illness or war. These grand dames crafted some of the most respected wines in the world. The best known was Barbe-Nicole Cliquot Posardin of Veuve Cliquot who, in 1805 at age 27, took over the Champagne house. She continued to send shipments to Russia, despite the uncertainty of trade during the Napoleonic wars. The shipments got through and her Champagne was so popular there that Chekhov wrote about it. Yet another interesting destination is the Riedel Glass factory in Kufstein, Austria, where readers meet Georg Riedel, who represents the 10th generation of his family to make crystal stemware. Riedel makes a case for his lineup of glasses and even has MacLean do a taste-off to compare his glasses with others. Most wine enthusiasts are familiar with these glasses, but how many can say they've visited the factory? Closer to home, MacLean pays tribute to the Seghesio family in Healdsburg, whose history dates back to 1902 when Edorado Seghesio opened his winery. At this crossroad, readers learn how the Seghesio family survived Prohibition, and how its old zinfandel vines continue to thrive. Retail shops are also on the itinerary. MacLean pays a visit to the Jug Shop in San Francisco, introducing readers to Chuck Hayward, a man many consider one of the most knowledgeable wine merchants in the city. At this juncture, MacLean weighs in on New World wines and why Australia has become such a fierce competitor. MacLean writes: "In 2003 Australia edged out France as the top exporter to the U.K., long considered the epicenter of the world wine trade - remarkable for a country that in 1990 produced just 3 percent of the world's wine." While some wine books can be a bit dull, this one offers a unique approach, a whirlwind of travel and a refreshing travel partner who's point-blank honest. She concedes she's visiting many destinations for the first time. And yet her enthusiasm is contagious - whether you're an experienced wine traveler or a rookie. Natalie MacLean, who lives with her family just outside Ottawa, has been writing about wine for years, picking up four James Beard and four Bert Greene awards along the way. Red, White, and Drunk All Over, however, is her first book, a selection of articles in which she immerses herself in various aspects of the wine trade to get a firsthand take on the people who make and sell wine. She spends time with Sonoma County's Seghesio family, as well as Santa Cruz's Randall Grahm, to get a handle on California's still-evolving direction. She brings a fresh appraisal to wine marketing by working in a wine shop, then going undercover as a sommelier in a fancy restaurant. She approaches wine with a patient openness, a candid sensuality and a knack at getting her subjects to blurt out telling details. Red, White and Drunk All Over: A Wine-Soaked Journey from Grape to Glass, by Natalie MacLean: Natalie MacLean is to Jennifer Rosen what Ed McMahon was to Johnny. She is unfailingly upbeat, a natural-born cheerleader, and she tackles the subject of wine with unbridled enthusiasm. She calls her work participatory journalism, and reading about her adventures in the wine trade is like cozying up with a friend's diary. This is a book that will be particularly enjoyed by women, for it puts a female perspective on an industry that was almost entirely male-dominated up until the last decade. Some readers may find the relentless first person accounts a bit breathless, the revelations less than earth-shattering. But wine is a complex subject that can be approached in myriad ways, and MacLean's breezy take on such weighty matters as wine ratings, biodynamic viticulture and choosing the proper stemware will strike just the right tone for those who are beginning to explore its many dimensions. The St. Louis Post-Dispatch published the same review as the New York Times. MacLean's memoir of her journey into and around wine is a grand start. She tells engaging, sensual tales about her first explorations. No lists, no quickie bits, but a long, satisfying read. She meets great people and places in her exploration, from the masters of Domaine Romanée-Conti to California's pioneering Seghesios. MacLean does color commentary on a great debate between Parker and wine writer Jancis Robinson, falls in love with Georg Riedel's crystal and his azure eyes. She tours wine stores and Champagne with equal intimacy and insight. As MacLean lures readers into her love affair with wine, she fills them with an easy knowledge of geography, names, farming and winemaking before they realize it. Whether you're an accomplished cook or merely someone who loves food, these books represent the best the year has to offer. Red, White, and Drunk All Over by Natalie MacLean. What's inside: A tour through the international world of wine by an expert who doesn't talk down to the reader. Best feature: The literary trip to MacLean's home for a virtual wine tasting. MacLean covers a range of topics, from working a harvest with iconoclastic Bonny Doon winemaker Randall Graham, to the feud between uber-wine writers Robert Parker and Jancis Robinson, to my favorite chapter - a discussion of wine glasses with my 37th cousin Georg Riedel. MacLean is knowledgeable without coming off as all-knowing, writes in a conversational style even though she doesn't avoid using complex wine terminology and has a nicely irreverent attitude toward it all. If that's what sells, maybe someday I'll get what I really want for Christmas - a book contract. More than 50,000 people take advice from Natalie MacLean on what wine to drink. Now if she could only get a waiter to hand her the wine list. "Whenever my husband and I go to a restaurant, unless it's a local one where they know me, he always gets the wine list by default," said MacLean, one of the best known wine critics in Canada and the author of the new book Red, White and Drunk All Over. "Tradition says it's the man who gets the list and the man who will decide, but my husband just hands it over to me. We've been in places where he'll hand the list to me, the server will see this, I choose the wine and they bring the bottle to him. There are some old, cobwebby areas of tradition that are holding fast." MacLean, a native of Nova Scotia, has been writing the wine newsletter Nat Decants from her Ottawa home since 2002. Readership has grown by more than 10,000 in the last year to 53,000, a jump she partially attributes to how easy it is for readers to forward the electronic version to friends. "I think people are just more interested in wine these days," she said on a trip home, during which she visited the Seven Wine Bar and planned to take her mother to dinner at Onyx. "Consumption is up. Just over the past year wine consumption has gone up 6 � per cent, and last year Gallup reported that for the first time more people said wine was their preferred beverage of choice over beer. "So consumption is going up, and with that goes greater appreciation, a desire to read about wine, visit wine websites, to plan a vacation to wine country, to take a wine course and to be more knowledgeable when you bring a bottle to someone's house." Many people, MacLean says, faced with the task of selecting a bottle of wine to present to a hostess, still use the method of choosing a bottle by the picture on the label. But the easier way, especially these days when red wine is so popular, is to take along a bottle of Pinot Noir, a versatile wine that pairs well with different types of food. When suggesting pairings, MacLean considers flavours, textures and body. "So if you have a light Dover sole, you don't want a big, heavy red," she said. "First of all, the flavours are going to clash but also texture-wise and body-wise, you want something light like the fish, maybe a nice little Riesling or something." MacLean sets aside two days a month as major "tasting days," days when she'll pour her first glass of wine as early as nine in the morning and tastes more than 100 different bottles before she's done. "Mornings are the best time to taste. That's when your palate is freshest; it's before the smells of the day have hit. So I . . . go as long as I can, spitting of course," she said. "When I first started I couldn't do more than 10 or 15. You also build up a tolerance, not for the alcohol, but for the elements of wine. They're kind of corrosive elements - tannin, acidity - and all that swirling around in your mouth. Over time you do develop a tolerance for tasting that many wines. Now, at the end of it, I know that my palate is starting to numb." "This is the critic's dilemma: the only way you get to evaluate wines is side by side, in a group. And the only way you can recommend enough wines is if you taste a large group, because you're trying to find the good ones, for readers." MacLean said with more than a million wine producers worldwide, wine writers and critics have considerable influence over the wines people drink because of the daunting number of choices and the resulting confusion. Adding to the dilemma is the fact that men and women may taste wine differently. "In terms of the way men and women order wine, it follows some of our natural tendencies. I'm generalizing here, but women ask for directions and men don't," she said. "Women often will talk to the server or sommelier and ask questions, which I think is a great idea. Men sometimes don't. Taste-wise, there's a lot of debate in the wine world about whether women are better tasters than men. There's no definitive evidence yet . . . but one theory says that women just have more taste buds, on average. Another says (due to) evolution we should be better tasters because we were the cooks." MacLean grew up in Lower Sackville, graduated from Sackville High School and spent her summers in Cape Breton, where both her parents were from. But Red, White and Drunk All Over, with chapters on France, California and MacLean's adventures as an undercover sommelier, has not one word about the wine industry in Nova Scotia. "I wanted to tell stories about people in the industry," she said. "I had an idea of what I wanted to do, chapter by chapter . . . so it was more about finding those people in the industry, but as I keep saying to all the wine regions who pointed out that they're not in the book: �Book Two! If you're not in the book, Book Two!' "
MacLean's vinous peregrination is light, easily consumed but delivers a surprising amount. A gung-ho enthusiast who uses grape shears to snip her fringe during a Monterey harvest, MacLean draws a graphic parallel between drinking wine at a tasting and later at dinner: "It's like meeting a person in a noisy bar who seems interesting, but when you bring him home he doesn't get quieter or shut up." From decapitating champagne with a sword to the life-changing effect of Chateau Latour, MacLean reminds us that wine writing should be as pleasurable as its topic. Red, White & Drunk All Over, Natalie MacLean's lively, entertaining and informative �wine-soaked journey from grape to glass�, is proof that this Canadian wine writer has a fair degree of bottle and an impressive store of knowledge about what goes into one. MacLean fuses the fruits of her imaginative and bold approach with sound background technical and business knowledge to provide a well-rounded tome suitable for wine veteran and newbie alike. MacLean is not one to shrink from a challenge or allow herself to be humbled by overbearing tradition. For instance, she barrels into the hallowed halls of Domaine de la Romanée-Conti in Burgundy with the same innocent enthusiasm as Dorothy mustered on her way to Oz. It is a remarkable passage. Few enough people get past the door, never mind find themselves entertained and indulged by the famous winemaker and co-owner of the legendary domaine, Aubert de Villaine. the vintage with a bottle of 1956 La Tâche. She guesses correctly, and he breaks into rhapsody. Monsieur de Villaine was not the only one to dwell on the sensuous nature of red Burgundy. The next day MacLean visits Lalou �La Tigresse� Bize-Leroy, a formidable pocket rocket of a woman who was once de Villaine's partner in Domaine Romanée-Conti before she was driven out after she bought a number of nearby vineyards and renamed them Domaine Leroy. like a peacock's tail: narrowly at first, then fanning out unexpectedly across the palate, with flashy aromas of raspberries, leather, sandalwood, smoke, burning autumn leaves and earthy truffles. She means "drunk" in a good way. This buzzed-about memoir by one of Canada's top wine writers (an occasional National Post contributor) takes you on a vino-soaked journey through her love affair with the grape. In her new highly readable autobiography, Red, White and Drunk All Over, wine writer Natalie MacLean writes that 80 per cent of wine's character is in its aroma and that smell is the only one of our senses that connects directly to the brain areas responsible for memory and emotion. This goes a long way towards explaining why the smell of a house, a flower or someone you are close to can evoke the strongest of emotions. The perfect pick-up-put-down book, MacLean's romp through the wine world tackles a different topic in each chapter. This Canadian author's goofy humor make her first-person accounts of encounters with renowned vintners, critics, merchants and sommeliers engaging reading even for the oeno-novice. And her passion for wine is palpable. (A typical MacLeanism: "I sniff the empty glass pathetically. I want to lick it, but draw a wobbly line of decorum.") The paperback edition of this breezy read is due out at the end of the summer. Wine writer Natalie MacLean's first book reveals that she, like wine, is full of contradictions. Her favorite pairings, such as Champagne with potato chips, are irreverent, yet MacLean is also an accredited sommelier with four James Beard Journalism Awards under her belt. The book reads like a diary; each chapter relays one of MacLean's wacky wine adventures. While she may appear unschooled, the snippets of information peppered through the book - on everything from malolactic fermentation to biodynamics - suggest that she has become the teacher. The knowledge is interspersed so casually that it is unconsciously absorbed with the engaging tales. She is unpretentious and fun, whether exploring vineyards in Burgundy, chatting up Georg Riedel, or working undercover in a posh restaurant. This is an entertaining beginner's guide to wine, wrapped in the guise of travelogue. �People just aren't as passionate about sofas as they are about shiraz,� MacLean writes in this memoir-meets-wine-guide. While furniture designers might beg to differ, the statement is a perfect example of both the tone and the philosophy that saturates the material. The book encompasses a lot of international ground, traveling from Burgundy to New York City to Sonoma. It loosely progresses from profiles about growers and reports about harvests to personal essays on adventures, such as going undercover as a sommelier in a busy, sophisticated restaurant for an evening. This gives the reader two ways to approach the book: chronologically or piecemeal. Either way is satisfying - it simply depends on your appetite. Though not one for jaded connoisseurs, this breezy read, told through the lens of personal experience, is a perfect pick-up for the passionate novice who likes a good anecdote along with a lesson on wine ratings. In short, the wine might be dry, but the writing isn't. It's amazing what a luxury reading can be. On the road, I find I'm often so exhausted that every night ends with me falling asleep in my bunk with the same paragraph plunked over my face. At home, the kids' schedules are often so rigorous that the same book sits bookmarked on the nightstand for weeks at a time. On vacation, I got lots of reading done, highlighted by a great new wine book by Natalie MacLean. Red, White and Drunk All Over was a breezy and fun read, but well researched and full of great storytelling. I also like the fact that MacLean is one of the few wine writers who's not afraid to admit to the alcoholic pleasures of imbibing, as well as the more commonly described sensual joys. MacLean does a great job of moving through several topics to get to her core point. For instance, she starts one chapter as a simple profile of Georg Riedel and his company's stemware, and weaves through her own experience of hosting a wine tasting before finally showing us why, at the end of it all, the joy of wine is the joy of sharing experiences and memories with friends and family. Along the way, we meet notorious characters like Lalou Bize-Leroy, Randall Grahm and Rémi Krug, but end up exploring bigger issues like wine's attachment to place, memory and our personal image of our own lives. It's one of my favorite wine books of the last several years, up there with Real Wine by Patrick Matthews and Making Sense of Wine by Matt Kramer, Wine Spectator contributing editor. Books about wine can fall into a number of traps, from merely eulogizing the great and the good to being downright dull. Natalie MacLean's collection of long essays avoids most of the common traps, but most importantly, the latter pitfall: it's written in an engaging and often humourous style that keeps you turning the pages. Many of the themes covered are already well-documented elsewhere - for example, the huge influence of American critic Robert Parker, the influence of terroir (and whether such a thing exists), the effect of the glass shape on the way a wine tastes - but the writing is unusually good and draws you in, even if you think you've heard it all before. Some of the most illuminating chapters are those where she works in an off-licence or as a wine waiter in a restaurant, and discovers how normal people, not just cork dorks, select their wine. This makes it the perfect antidote if you're fed up with po-faced wine writing. Speaking of Ottawa, there is another, more experienced, woman tackling the matching of food and wine-this time on the Internet. Natalie Maclean has garnered many wine writing awards for her magazine articles, as well as for last year's book called Red, White, and Drunk All Over: A Wine Soaked Journey From Grape to Glass and her much hit-upon Web site, Nat Decants. Recently, she has launched the Wine and Food Matcher, a tool that takes users from the dish they are preparing through likely wine style/regional matches and directly into her database of tasting notes on specific wines released at Vintages and the LCBO. Overall, its wide-reaching food and wine parameters, and its ability to zero in on wines that are on-shelf, make it a useful tool for wining and dining in Ontario. I used to think that "food" and "books" could only merge to produce cookbooks -- or a serious mess. Then, a good friend lent me Kitchen Confidential by the loveable rough-and-tumble American chef, Anthony Bourdain. How had I missed this whole genre? I devoured (pardon the pun) the entertaining stories about the hard-core kitchen staff, Bourdain's intense training and even his floundering personal life. More than anything, I could taste his passion in every sizzle, chop and culinary flourish. I was hooked on food literature. It seems I'm not alone. From dinner parties to book stores to boardrooms, everyone wants to talk about their favorite nonfiction food books. They're galloping through Heat by Bill Buford, Garlic and Sapphires by Ruth Reichl, Climbing the Mango Tree by Madhur Jaffrey and the classic The Art of Eating by M.F.K. Fisher. Readers are insatiable for highly personal stories from the world of food, wine, and all things epicurean. Publishers are also receiving more proposals for food-based literature. "I think that the popularity of the Food Network and lifestyle television programming has widened the market and interest of readers in this area," says Kristin Cochrane, associate publisher for Doubleday Canada. "I also think that readers of literary nonfiction writing tend to be interested in the writing quality first, and the subject area second." Food memoirs are increasingly hot sellers, confirms Barabara-jo McIntosh, owner of Barbara-Jo's Books to Cooks -- a veritable paradise for foodies with a literary bent. Our overall interest in food is clearly growing, says McIntosh, but the tumultuous social and political climate can also draw people back to comforting basics. "Who can't be happy if you're talking about food or reading about nourishing yourself? It's gentle." While my beloved Bourdain is rarely gentle, there is something innately satisfying about a juicy food memoir. "If you eat well, you live well," suggests McIntosh, who praises the iconic Julia Child for her highly descriptive style. "She talked about food, and you could just taste it in your mouth." With great food comes great wine, so it follows that grape lovers are also penning more books. These tipsy memoirs are a significant departure from mere pairing guides or vintage catalogues. Just this month, Natalie MacLean's Red, White and Drunk All Over was named the best wine literature book at the Gourmand World Cookbook Awards. It's no small honor, given that more than 6,000 books from 60 countries compete for these annual awards, designed to reward writers who "cook and drink with words." "I try to write as though I'm talking to a girlfriend in the kitchen and we're just pouring ourselves a glass," says MacLean, whose energetic and chatty, yet informative, writing style carries readers through the intricacies of grape varietals and growing techniques. Even before her book was published, MacLean's magazine columns, website and "Nat Decants" e-newsletter had drawn thousands of fans and multiple industry awards. The book's personal tone and behind-the-scenes stories, however, have prompted people to e-mail MacLean about reading her book from a hospital bed awaiting heart surgery, or other intimate scenarios. "There's a connection there that's both startling and wonderful," says MacLean, whose experience also highlights why culinary memoirs thrive with a first-person narrative. "If you take the human element out of writing about food and wine, it's pretty empty." Do readers really care about active yeasts and secondary fermentation? Or do they long to understand wine's seductions, and its otherworldly sense of place? Do they care about a region's production, or would they rather hear how a glass of juice resembles a curvy redhead, and why it makes them feel the way it does? You know, drunk. This is among Natalie MacLean's first points in Red, White, and Drunk All Over: A Wine-Soaked Journey from Grape to Glass. A descendent of Celtic alcohol-lovers and livers, MacLean, a sommelier, writes first and foremost from a sensual place, dispelling many commonly held myths about wine writers: she doesn't spit a whole lot, and she loves the buzz just as much as she loves obsessing over the grape. The book is entertaining, informative and ideally suited for someone who has a working knowledge of wine. From her first visits to Domaine de la Romanee-Conti and Domaine Leflaive to her honest appraisal of biodynamics in Burgundy - she's on the fence - MacLean's observations are cerebral and spot-on, and her language both beguiling and accessible: "Some wines will always taste like a lost argument or a long embrace." The book lacks an index, but is part-travelogue, part-memoir. You learn as she learns. From Burgundy, MacLean leads us to the cellars of Champagne, winning points with readers who might not be familiar with the grande dames who have kept that region running. We meet Gerard Liger-Belair, a professor of bubby at the University of Liger-Belair before taking off for the land of Zinfandel, and MacLean's internship with Randall Grahm of Bonny Doon Vineyards. It's hard to decide if it's MacLean's colorful prose, pop wine sensibility or portraitures of winerati that make her book so readable. The latter is definitely the case when it comes to Grahm, who, through MacLean's eyes, comes across very much like one of the wild-eyed Ralph Steadman drawings that grace his bottles. In other words, spot-on. The book quiets down a bit when MacLean gets practical. She pulls a nine to five at two wine stores - The Jug Shop in San Francisco and Discovery Wines in New York City - and even does sommelier duty at Le Baccara in Quebec (yes, she drips). She shows you how to throw a tasting party. She takes on Georg Riedel and Robert Parker and devotes too much of the book's denouement, sacrificing her flow, in my opinion, to wine auction number-crunching, but makes up for it by ending on a lavish dinner with Jay McInerney, the 1980s cocaine-novelist-turned wine writer, who tells her: "Wine makes me more thoughtful. I always want to taste the next thing so it slows me down; I pace myself. Wine saved me from rehab." And MacLean saved us from another predictable wine book.